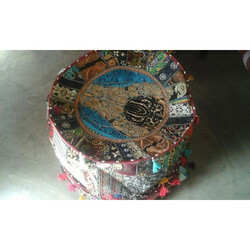 Offering you a complete choice of products which include patchwork chair pad, embroidered patchwork chair pad, embroidered floor cushion, vintage kantha floor cushion and pache work floor cushion. An amazing work of art that would leave you spellbound! 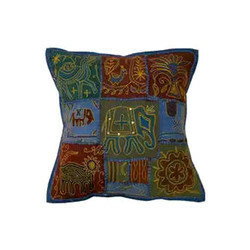 This is very picturesque completely hand crafted, embroidered Floor pillow cover. Vintage patches from old, precious wedding saris from India are patched together at random to create a collage like effect. The result is a majestic kaleidoscope of bonanza of colors with heavy embroidery. If you are fashion savvy, want to be unique, different and set a trend, this is definitely for you. Spruce up your room with this spectacular masterpiece of work. A look at this floor pillow makes us realize the painstaking & laborious work involved, not to mention days that one piece takes. The entire cover is decorated with all kinds of colored beads, studs, patchwork, raised colored thread work and embroidery in intricate designs. Zippers or overlapping slits allow you put in the cushion, filling or insert.This pillow cover is also wonderful as a table topper or as a multicolor tapestry, especially for walls that require a focal point.Guaranteed to bring you lots of compliments and truly a bohemian crazy, conversational piece of accessory that everyone’s room needs These chair pads are also available in various sizes and are perfect for use in chairs. They are light in weight and available in various colors We designer and manufacture of Chair Pads which are not only comfortable to sit on but also stuffed with pure cotton. 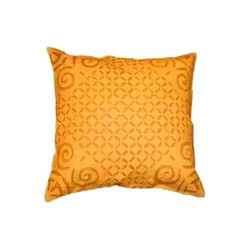 Gouri Handicraft brings to you decorative Exclusive ethnic Designer Indian Floor cushion covers at discount prices. Hot selling home textiles and Wholesale Hand embroidered mirror work FLOOR CUSHIONS in assorted colors from manufacturer in India at discount price from Jaipur, India. Gouri Handicrafts presents one of the fastest selling product this year. Beautiful bohemian Embroidered Floor Cushion, mirrorwork fabric floor cushions in box shapes available in large variety and colors. An amazing work of art that would leave you spellbound! 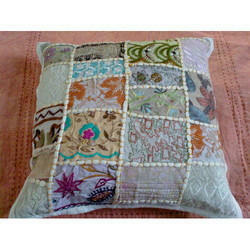 This is very picturesque completely hand crafted, embroidered Floor pillow cover. Vintage patches from old, precious wedding saris from India are patched together at random to create a collage like effect. The result is a majestic kaleidoscope of bonanza of colors with heavy embroidery. If you are fashion savvy, want to be unique, different and set a trend, this is definitely for you. Spruce up your room with this spectacular masterpiece of work. This is traditional unique pache hand work floor cushion. As this is Applique Hand Patch Work, There will be variation in patches. 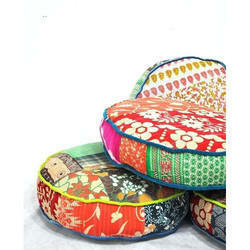 Looking for Floor Cushions and Chair Pad ?